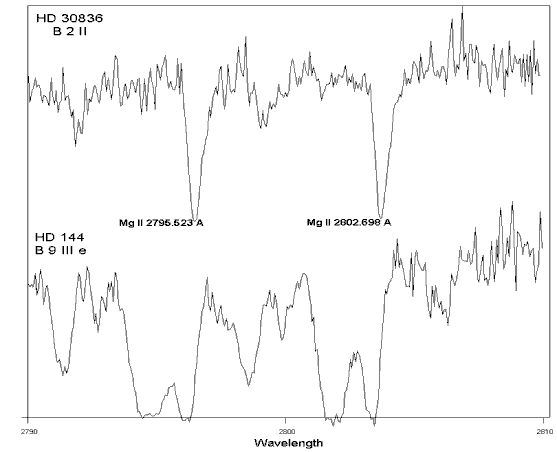 All the stars of the same spectral type and luminosity class present the same absorption lines in their spectra. Figure 1: Two Be stars of the same luminosity class present the same absorption lines in their spectra. 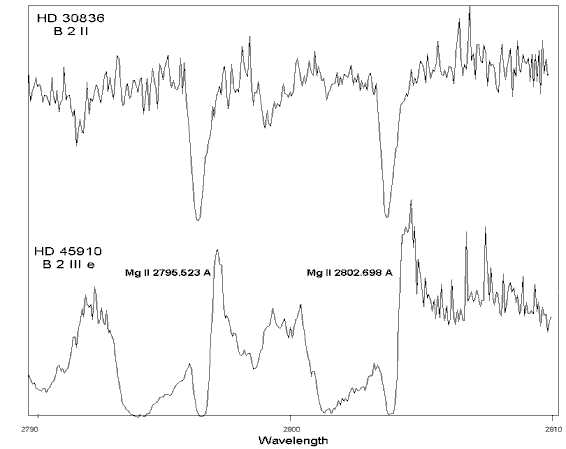 Figure 2: In these figures we can see the comparison of Mg II resonance lines between the spectrum of a normal B star and the spectra of two active Be stars that present complex and peculiar spectral lines. 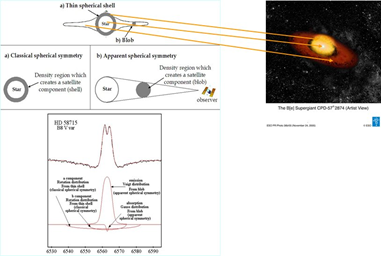 As we can observe the Be stars present some absorption components that do not appear in the spectrum of the classical B star. 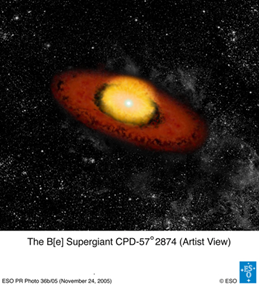 What are the main characteristics of Hot Emission Stars? 2. Ηigh rotational velocities (between 40 to 400 km/s). 3. Emission lines in the Balmer series. 4. Some time emission lines in the UV region (e.g. MgII, Lya). 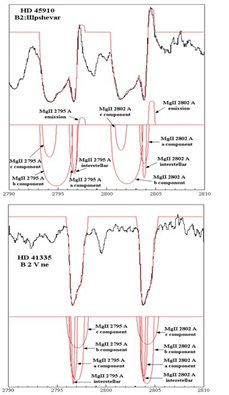 In the case of hot emission stars we call the absorption spectral lines that do not correspond to any known absorption line of the same spectral type stars DACs (Discrete Absorption Components) (Bates & Halliwell 1986 MNRAS). Figure 4: DACs are not unknown absorption spectral lines, but spectral lines (Satellite Absorption Components) of the same ion and the same wavelength as a main spectral line, shifted at different Δλ, as they are created in different density regions which rotate and move radially with different velocities. 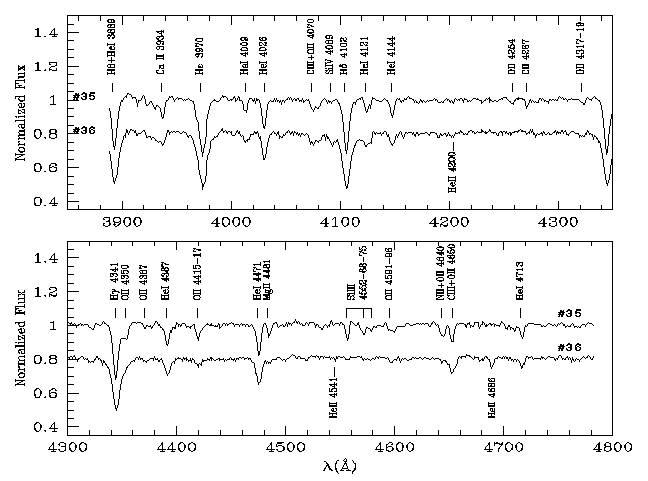 Figure 5: The density regions which create the observed DACs in the stellar spectra. 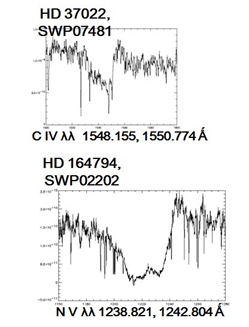 Another problem of this group of hot emission stars is the presence of very complex profile of the spectral lines that we can’t produce theoretically. This means that we could not know the physical conditions that exist in the high density regions that construct these spectral lines. 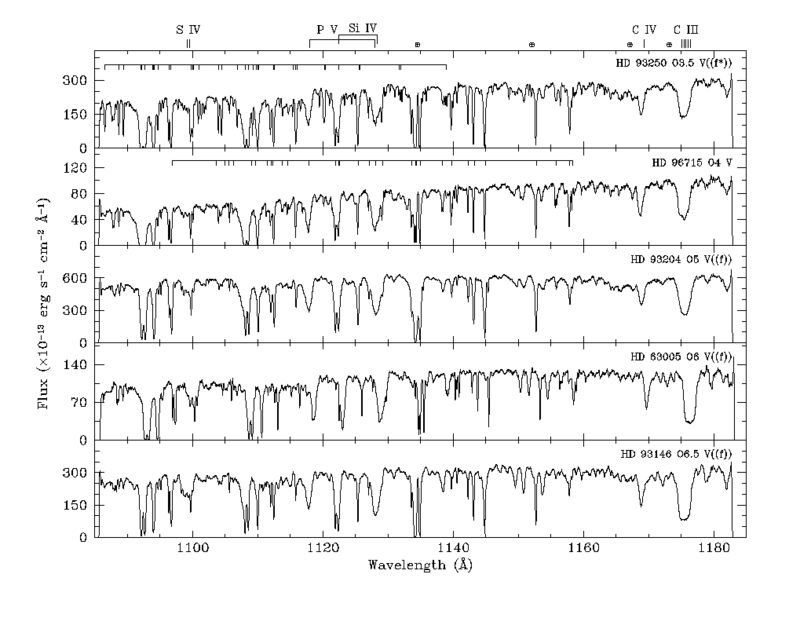 Figure 6: The very complex profile of the N V spectral lines in two Oe stars. In order to explain this complex line profile our scientific group proposed the SACs phenomenon (Satellite Absorption Components). If the regions that construct the DACs rotate with large velocities and move radially with small velocities, the produced lines have large widths and small shifts. As a result, they are blended among themselves as well as with the main spectral line and thus they are not discrete. In such a case the name Discrete Absorption Components is inappropriate and we use only the name: Satellite Absorption Components (SACs) (Sahade et al. 1984, 1985, Danezis 1984, 1987, Lyratzi & Danezis 2004, Danezis et al. 2006). 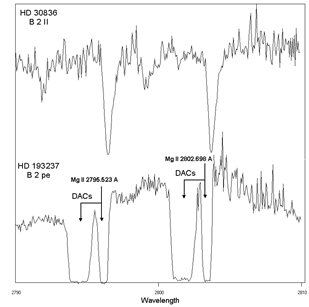 In the following figure it is clear that the Mg II line profiles of the star AX Mon (HD 45910), which presents DACs and the star HD 41335, which presents SACs are produced in the same way. The only difference between them is that the components of HD 41335 are much less shifted and thus they are blended among themselves. The black line presents the observed spectral line’s profile and the red one the model’s fit. We also present all the components which contribute to the observed features, separately (Danezis et al. 2006). Similar phenomena can be detected as an effect of the ejected plasma around peculiar stars. For the time being and for more details visit the webpage of my colleague, collaborator and friend Emmanuel Danezis.